Our 9/11 pins and jewelery are great ways to show your support each and every day for those who gave all on 9/11. We've got a wide selection of pins and jewelery, ensuring that there's something that will work for you! 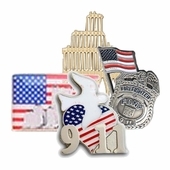 Our most recent addition to our 9/11 Pins and jewelry collection is our 9/11 10th Anniversary pin. This pin is a great way to honor and celebrate the 10 years of recovery and patriotism that have passed since that fateful day. However, these pins were only made in a limited number, so order yours today! We also have pins that honor the first responders who went running in when everyone else was running out. Our FDNY Shield Pin and FDNY Badge pin are great ways to honor these departments which gave so much. We also have a beautiful 9/11 Dove pin and several elegant World Trade center tower pins. Of course, we're especially proud of our 9/11 World Trade Center flag pin. This flag pin is a great way to show your support and remembrance each and every day.